Another look at the diverse collection of pilots who fought for Israeli independence, underscoring Nancy Spielberg’s recent documentary, Above and Beyond, among other accounts. In his engaging new book, military and aviation historian Gandt (The President’s Pilot, 2014, etc.) 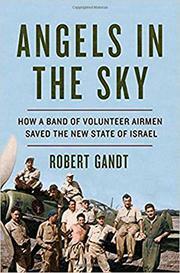 reveals the significant contributions of American and Canadian airmen in defending the nascent Israeli state against attacks by its Arab neighbors shortly after the nation’s 1948 independence. A gifted storyteller, the author begins his chronicle with the trepidation of David Ben-Gurion, then president of the Jewish Agency Executive, on the eve of Israeli independence. He knew that the wild jubilation of a U.N. vote for partition of Palestine in November 1947 would soon be followed by war once the British withdrew in May and that the surrounding five Arab countries would “roll like a seismic wave across Israel.” Gandt tells the astounding tale of how a handful of committed people, led by Al Schwimmer, an American World War II veteran and flight engineer for TWA, managed to convince the leaders of the Haganah—Israel’s fledgling defense arm—that building an air force was the only way to win a war against the Arabs. In a few short months, Schwimmer and other veteran pilots, many of whom were Jewish, worked under official U.S. radar to secure war-surplus airplanes—nonglamorous but sturdy transport aircraft like the C-46 Curtiss Commando, DC-3 and C-46, as well as the Lockheed Constellation, and even Messerschmitts from Czechoslovakia—because of U.S. restrictions imposed by the Neutrality Act of 1939. After creating a Panamanian front company, reconditioning the planes, and doing some quick training in Czechoslovakia, the fledgling, newly named Israeli Air Force was enlisted to counter Egyptian spitfires almost immediately upon Israeli independence. Over the next few months, they performed a series of military miracles, all of which Gandt delineates with aplomb. An exciting military chronicle packed with well-documented, intimate portraits of a group of brave pilots.